The galactic southern object HD 50138 (V743 Mon, MWC 158) is known for almost one century. Nevertheless, its classification in terms of evolutionary phase is still unknown. In the literature it was classified as either a young, pre-main sequence star, or as a classical Be star, i.e. a main-sequence star with Balmer-line emission. The presence of a circumstellar disk was postulated based on polarimetric observations. However, the presence of circumstellar dust certainly speaks against a classification as "classical" Be star, and the possibility of a transition object between Be and B[e] was proposed. It was also suggested that HD 50138 might be a binary, but no indications for a companion could be found so far. The proper classification of HD 50138 is certainly hampered by its strong spectral variabilities reported in the literature. These spectral variabilities happen on time scales from days to months and were proposed to be linked to shell-phases of the star. In addition, small-scale photometric variabilities have been recorded. On top of these "normal" variabilities, the photometric data of HD 50138 displayed indications for an outburst that took place in 1978/79. The shell-phases, however, are invisible in photometry, as the one in 1990/91, which was only detected in spectroscopy. Given the strong variability in the lines and the continuum, it is not surprising that published stellar classifications range over several sub-types (from B5 to A0) and luminosity classes, because we can expect that the determinations depend on the method (or lines) used for the classification, as well as on the period at which the observations were obtained. With the aim to confine the stellar and disk parameters of this highly variable object, we observed HD 50138 with high-resolution spectroscopy, collected photometric data from the literature, and performed interferometric observations. 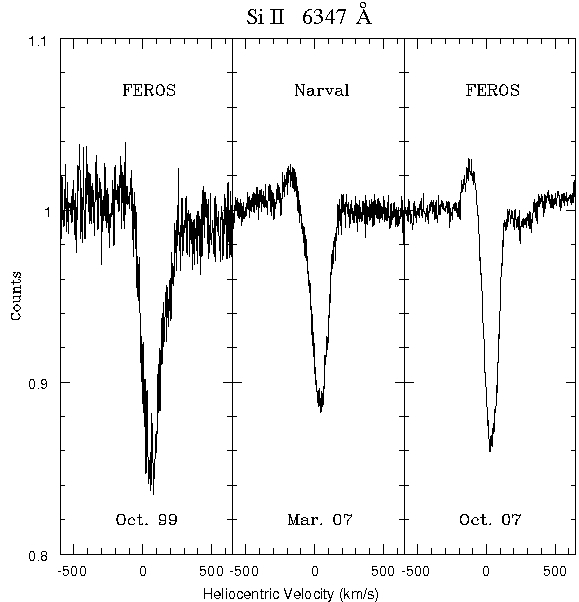 High-resolution spectroscopic observations of HD 50138 have been obtained in October 1999 and October 2007 with the Fiber-fed Extended Range Optical Spectrograph (FEROS) attached to the 1.52-m and to the 2.2-m telescopes at the European Southern Observatory (ESO) in La Silla (Chile), respectively. 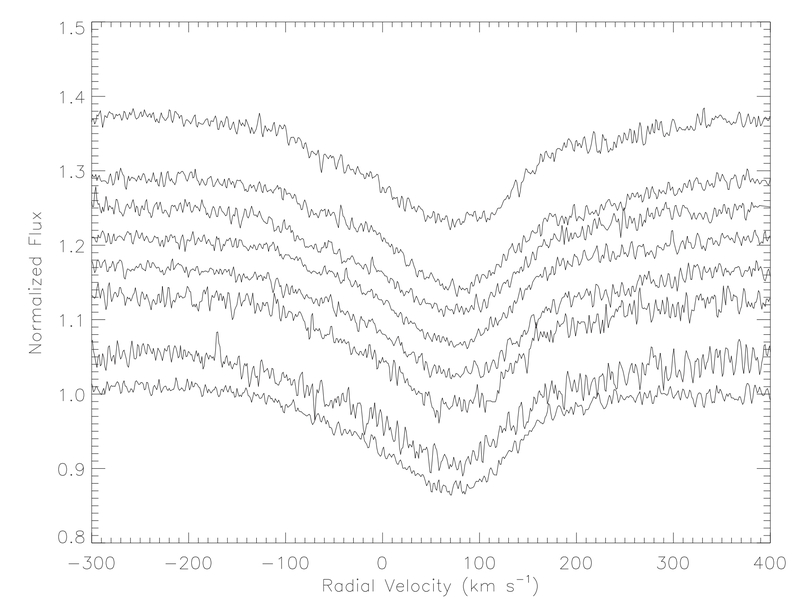 Additional, high-resolution spectra were collected in March 2007 with the Narval spectro-polarimeter at the Bernard Lyot telescope at the observatory of Pic du Midi (France). Interferometric data were obtained using both the VLTI MID-Infrared Interferometric instrument (VLTI/MIDI), operating in the mid-infrared, and the Astronomical Multi BEam Recombiner (VLTI/AMBER), operating in the near-infrared. 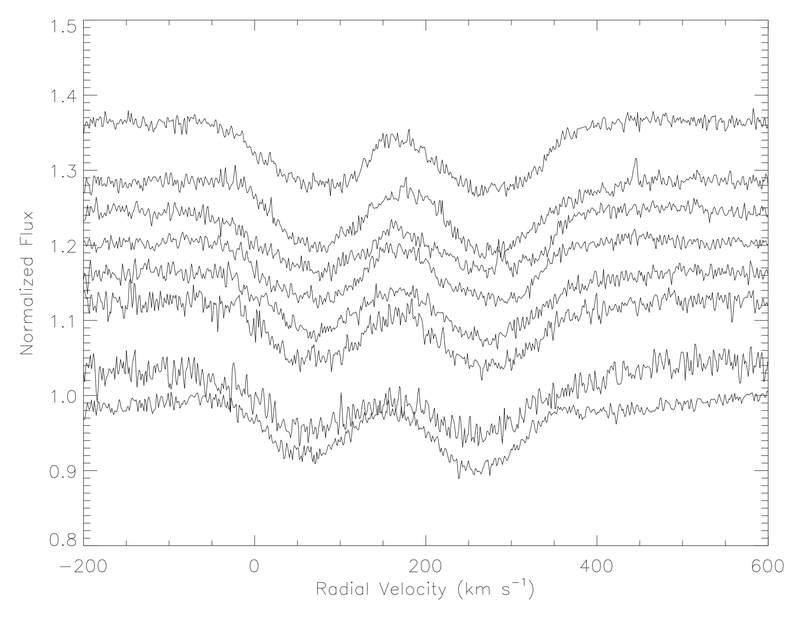 In addition, N-band interferometric data from the Keck telescope were kindly provided by John Monnier for our analysis. The determination of the stellar parameters of HD 50138 is difficult, since both its spectral lines and its continuum show strong variations. Nevertheless, we made use of its mean color indices (U-B) and (B-V) to obtain a first estimate of the spectral type and luminosity class of HD 50138. For comparison, we used intrinsic colors from Schmidt-Kaler (1982) of stars in the spectral range B3 to A1 and luminosity classes II to V. This comparison delivered possible classifications as a B5.5-7.5 V, B5.5-8.0 III/IV, or B7.5-8.5 II star. In addition a maximum value of the total extinction of E(B-V) = 0.15 was derived. To extract the contribution of the interstellar extinction value, we made use of the diffuse interstellar bands (DIBs) arising in the optical spectrum. Their equivalent widths indicate an interstellar extinction of E(B-V) = 0.08 only, meaning that about half of the measured extinction must be circumstellar in nature. Circumstellar dust is a natural source for extinction and the strong infrared excess of HD 50138 favours dust as an ideal candidate. We computed possible dust extinction values assuming small grains, large grains, and a grain size distribution of the dust particles as suggested by Mathis, Rumpl & Nordsieck (1977) and used a mixture of silicates and amorphous carbon. It turned out that the proper needed amount of circumstellar extinction can be provided only for stars with spectral type B6-7 III-V and B8-8.5 II. Interestingly, large grains alone cannot account for the needed extinction. We also checked the influence of an ionized disk as a source to alter the observed colors of the star. 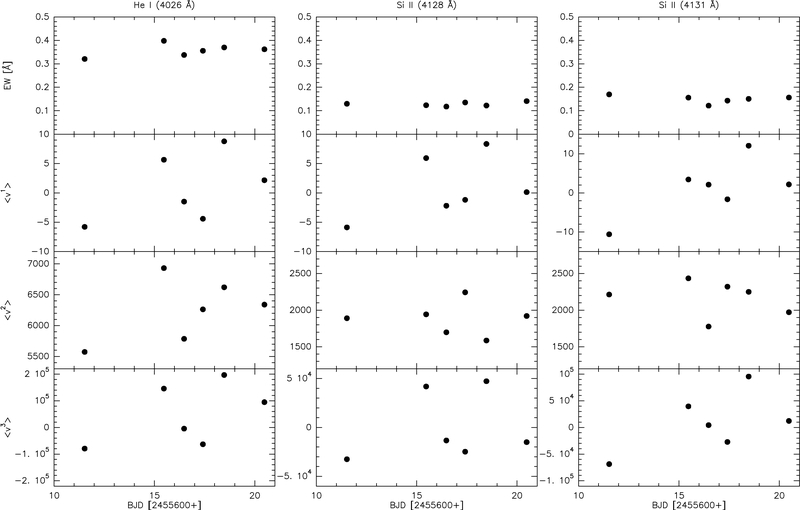 From this analysis, we obtained the same range of stellar classifications. We can thus not distinguish between the two scenarios. 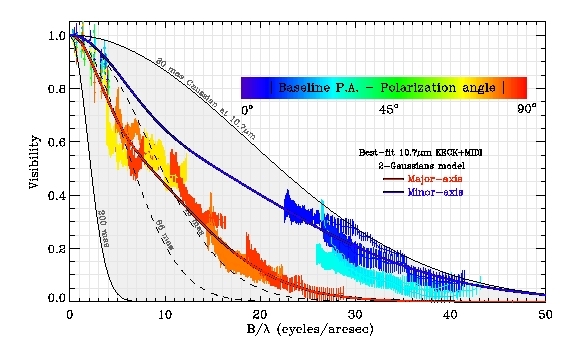 However, we can further refine the stellar classification based on the presence of photospheric absorption lines of ionized silicon in our high-resolution spectra. From the ratios of their equivalent widths we can definitely exclude a classification of HD 50138 as a B8-8.5 II star, thus leaving us with a B6-7 III-V star with an effective temperature of T = 13 200±500 K, and, based on the new Hipparcos distance of 500±150 pc, a luminosity of about 1150 solar luminosities. A new shell phase ? The variability in the line profiles reported in the literature seems to be caused by shell-phases and/or outburst events. Comparing our high-quality spectroscopic data from the different observing epochs, we can see a sort of temporal evolution, in particular an increase of a blue emission component and a redshift of the absorption ones. 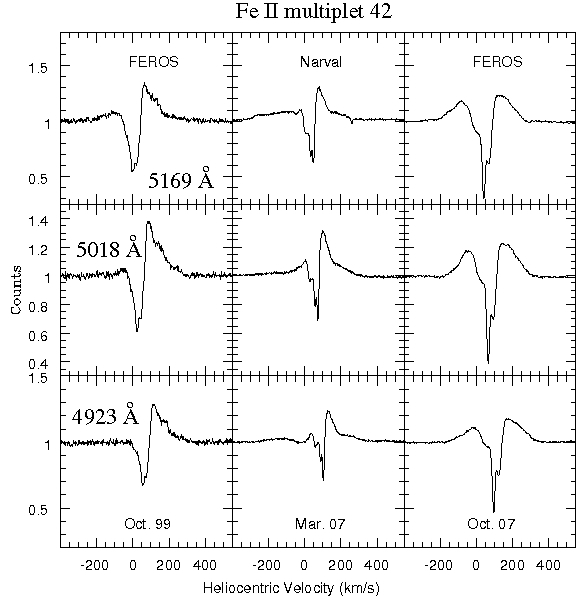 For illustration we show in the following figures the comparison of the three lines from the multiplet 42 of ionized iron and of one line of ionized silicon. We thus tentatively conclude that the changes seen in the line profiles mirror a new shell-phase, during which a substantial amount of material was ejected from the star, took place prior to our Narval observations in March 2007. Between 2007 and 2009 HD 50138 was observed interferometrically with AMBER, MIDI and the Keck telescope using many different baselines and position angles in order to get a reasonably good coverage of the (u,v) plane as indicated in the following figure. The coverage with the Keck telescope is indicated by the green circle in the left panel; the red lines in both panels indicate the polarization angle obtained from the literature. From our best fit model, we were able to obtain a more complete picture of the dust distribution around HD 50138: we conclude that the star is surrounded by a large dusty disk seen under an inclination angle of 56±4 degrees. Its major axis is roughly perpendicular to the polarization angle. In addition, the disk most probably has a small opening angle, meaning that the dust is definitely not along the line of sight. Hence the circumstellar extinction discussed above results from the circumstellar gas. From the mid-infrared data we can additionally conclude that the disk must extend to distances larger than 30 AU. The 10 micron spectrum also displays a strong emission of the silicate bands. 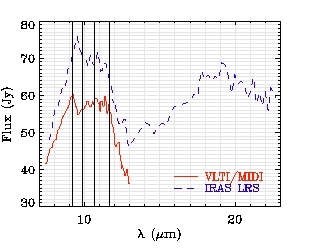 A comparison of our MIDI spectrum with the older IRAS spectrum is shown in the following figure. The vertical lines thereby indicate the wavelengths of crystalline silicate like ortho-enstatite. With the new information on the stellar parameters and the disk we can discuss the possible nature of HD 50138. The knowledge of its effective temperature and luminosity allow us to plot its position within the empirical Hertzsprung-Russell diagram (HRD). This is shown in the following plot where we compare its position with pre- (lower panel) and post-main sequence (upper panel) evolutionary tracks. If HD 50138 would be a pre-main sequence object, it would be about half-way from the birthline (fat solid line) to the zero-age main-sequence (dotted line) where it would appear as an intermediate mass star in the range of 5-7 solar masses. Although the spectral and photometric variations as repoted for HD 50138 are similar to those known from young stellar objects, there are several arguments speaking against the classification of HD 50138 as pre-main sequence star: (i) there is no nebulosity around HD 50138 and the star is not located in or close to any star-forming region, (ii) young stellar objects are not known to undergo shell ejection phases and outbursts as seen in HD 50138, and (iii) although a dusty disk is seen around HD 50138, there exist no indications for ongoing accretion activity in this disk, as would be natural for a young pre-main sequence star. The classification as a star close to the end of the main sequence, as indicated by the location of HD 50138 in the HRD of the top panel seems thus to be favourable. The main-sequence in this mass range is also populated by classical Be stars, and only the presence of dust in the disk of HD 50138 disqualifies it from such a classification. However, its high-density circumstellar matter and the gaseous ionized inner disk speak in favour of rather high mass-loss, i.e., a mass-loss activity which is much higher than for classical Be stars. In that respect, HD 50138 might be an extreme Be star or, in other words, a transition object between Be and B[e] stars. 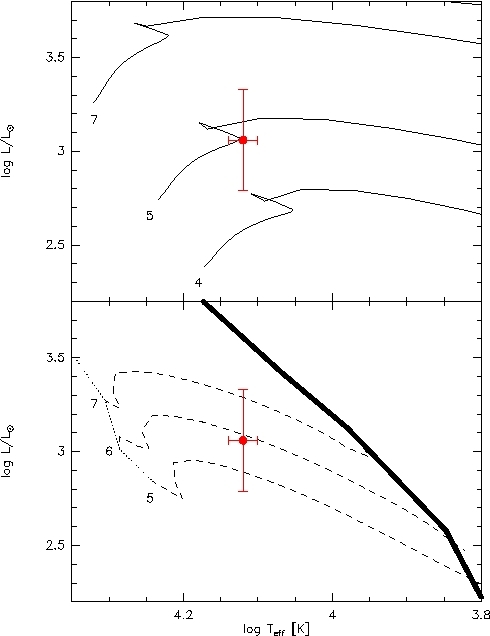 Line-profile variability in HD 50138 - a hint for stellar pulsations? An additional curiosity that was recently observed in this peculiar object is strong line-profile variability on short (night-to-night) time-scales. This has been found from a set of high-resolution optical observations obtained in the period 2011 February 19 to 27 with the HERMES spectrograph attached to the 1.2m Mercator telescope. Pure photospheric lines are extremeley rare in the spectrum of HD 50138, and we could identify only three, which are strong and non-blended. These are the He I (4026) and the Si II (4128, 4131) lines. Their profiles over the course of the observations are shown in the left and right panel of following figure, respectively. Time in these plots increases from bottom to top, and for a better visual inspection we shifted individual spectra along the vertical axis with offsets proportional to the interval between the observations. To analyze the line profile variability we applied the moment method. The results for the equivalent width and the first three moments are shown in the following plot as a function of Julian Date. Obviously, all three lines display strong and similar variability, hinting towards pulsations as a plausible cause. However, a better time coverage of tha variability is definitely needed to confirm or disprove the presence of pulsations acting in the atmosphere of this curious object.